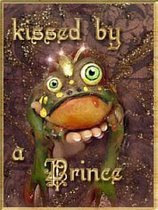 barton originals: WOW...Kissed By A Prince!! This is a new award that artist extraordinaire and master magical-being creator, Silke Janas-Schloesser has created and according to her blog, will be bestowing it on tickled bloggers every Tuesday! Yaaayy Tuesdays! but please do yourself a favour and also check out her blog if you don't already. It is fun, imaginative and also very inspiring. 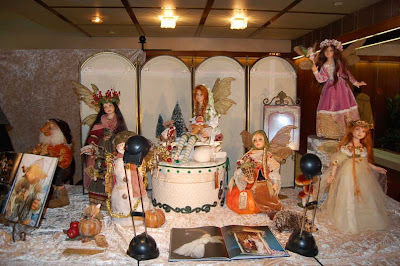 And you will discover lots more of her enchanting creations there. Thank you so much Silke, for this recognition - it means so much to me! Silke's assistant (although I sometimes question just how much "assisting" she does when reading about some of her episodes, but shhhhhh, we don't want to hurt her feelings). Now, riding the high of this award, I'm off to my studio to start my Broken Heart ADO challenge piece, which has to be done by Feb. 1st...yikes! 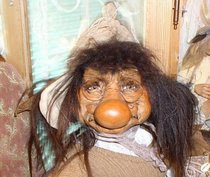 PS--verification word of the day: "exomenl"
Such wonderful whimsical creatures, thanks for the new blog and site to check out, amazing doll makers! past boyfriends/husbands/significant others of a gal who has been around the block a couple of times. Kaerie, you are welcome! Silke's work is pure delight! Oh Sue...you so deserve this Award! Congradulations my friend! You are one of the amazing artists that soooooooo admire and can call friend! I've enjoyed so much getting to know you and your artwork, your heart, and your engery inspires us all! Congrats again! Ah Michelle, that is so sweet! Thank you my friend! You deserve it!! Your work is really breathtaking. What a compliment to receive an award from an incredible artist like Silke. I also loved the random things you listed and I think its awesome that besides your art you sell vintage stuff too. Lastly, that clay has been going way too dark on me too, its like hit and miss for me lately! When I go to IDEX this weekend I'm gonna ask some friends about their clays. comments on my award - and yes, I agree with you totally regarding Silke! Thank you for reading my random things post too! Congratulations for the appreciation! Silke is so so marvellous, kind and enormous that she don´t fit in any sentence! Sorry because I can´t write to you so frecuently, It´s because by problem with the english, arfff, It takes me a lot to express myself.. but always see and read you everything you make! Roberta sends you a kiss, and I´m not going to be less, of course! WOW! Congratulations! Prince kissing is exciting!